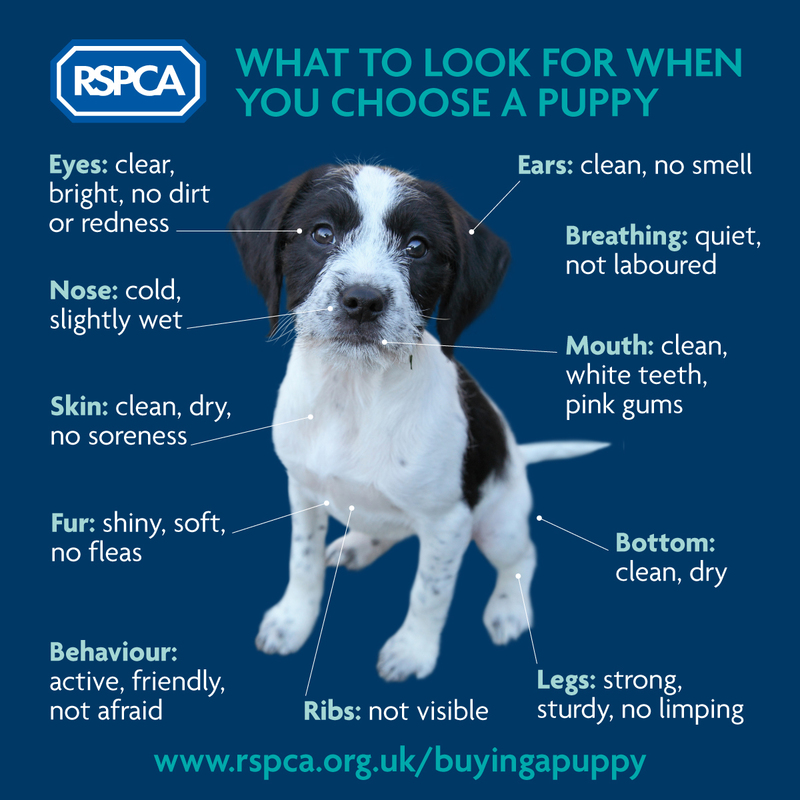 When meeting or choosing a puppy there are things you can look for to help ensure the puppy you're buying is healthy and happy. Eyes should be clear and bright, with no sign of dirt or redness. Ears should be clean with no smell or signs of wax inside that could mean ear mites. Nose should be cold and slightly wet, with wide open nostrils. Breathing should be quiet and effortless with no snoring, coughing, grunting or wheezing. Skin should be clean, dry, with no signs of soreness or folds that can become infected. Mouth should clean, with white teeth and pink healthy gums. Fur with shiny and soft with no sign of fleas. Legs should strong and sturdy, with no limping or difficulty walking. Bottom: clean and dry under the tail. Your chosen puppy should be bright, active and friendly. Avoid a puppy that appears timid or afraid as you may well find that they experience behavioural issues later in life. If you¿re satisfied that the puppy you¿ve chosen is healthy and happy, and you¿re confident you¿ve chosen a good breeder it¿s now time to think about taking your puppy home. There is one more thing you can do to help ensure that you¿re buying from a responsible breeder. Ask your chosen breeder to complete Puppy Information Pack and contract for the sale and purchase of a puppy. A good breeder should be happy to do this. Remember If something doesn¿t seem right, it probably isn¿t. Although it¿s tempting to `rescue¿ the puppy, you will be financially supporting the trade and sadly, another puppy will just take their place - instead, walk away and report your concerns to us immediately. Bringing a new dog home can be exciting and a bit daunting. To help ensure you get off to a good start take a look at our guide to your puppy's first year.